This is our breakfast today: Chicken Satay, Nasi Himpit (pressed rice), Peanut sauce, cucumber & onion. I made two versions of satay, grilled Satay with sticks (above) & fried Satay without sticks (below). Making Satay is not difficult as many people would think and homemade is always the best as you can be generous with thicker chicken meat. With inflation rising high, those sold out there are made economically in order to be profitable. After comparing several versions of recipes from Hana, Kak Ina, MyR(Jun), here what I came up with. Thanks to all for being inspirational. 1. Blend all ingredients marked * & **. 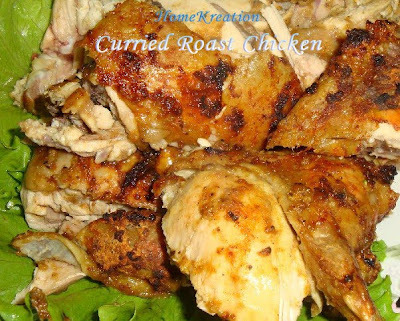 Marinate chicken with the blended ingredients & the rest in fridge overnight. Thread chicken meat onto satay sticks. Grill & baste with bruised lemongrass dipped in oil. Heat up some oil & stir fry marinated chicken above big fire until dry & golden in colour. 4. Serve with peanut sauce, Nasi Himpit & cucumber. Add some chili oil to peanut sauce to spice up. Salam auntie2 cayaaang..... here I am backed..... today mummy going to take me out for shopping... I'm tired staying at home! My dad bought me a hip-hop clothes, see below my hip-hop clap-clap! Recent development, Liana can stand up by herself for about a minute and clapping her hands. One more vocab added this month... Liana can call her babysitter "Kakak" ....! So altogether she has gained 5 vocabs (Abah, Mama, bird, amau (means no) & Kakak)... clever eh! I straight away wrote down yoghurt in my shopping list after I saw the cake at Ijan's house but there were just too many hurdles to get it done. I am so glad I finally get to make it tonight and actually it took me only about 10 minutes to prepare it. 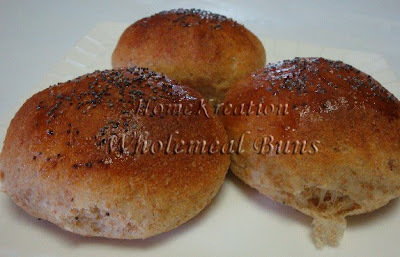 I was so surprise by the outcome .... very rich, super moist and most of all crazily delicious! Thanks Ijan for sharing such a delectable recipe. Here is the recipe which I rewritten for my own ease of reference. You can check the original recipe by Ijan here. 2. Mix all ingredients marked*. Add in the rest ingredients one by one by order. Use hand whisk to mix until well combined. 3. Bake for 30 min. Cool & cover with frosting. (Below is the original frosting recipe from Ijan but I did not use it. Mine is simply a mixture of condensed milk & milo). a. In a medium size bowl add the margarine, powdered sugar and cocoa powder. Start beating with an electric mixer on low speed. At this stage it may seem to be very dry. Don’t panic. Wait until you add the milk. b. Add milk little by little and continue beating the mixture till you get a nice spreadable consistency. c. Cool down in fridge for at least one hour (the texture of the frosting will look better after at least one hour in fridge). There was a leftover yoghurt after making chocolate cake just now & decided to dump it into the above chicken curry instead of using coconut milk. Not a bad substitute. Come and drool over my outrageous cheesecake.... Sorry, tonite am going early to bed after heavy dinner & dessert...so goodnite all! 1. Crush oreo cookies & mix well with melted butter. Press into tart tin & bake 10 min. 2. Beat cream cheese & sugar until soft. Add in egg & cream & continue beating until smooth. Bake for 30 min at 160C. Cool completely. 3. Melt chocolate & mix in cream. 1. 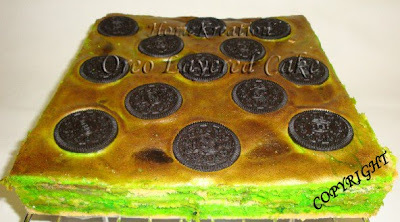 Hancurkan biskut oreo & gaulkan dgn mentega cair sehingga sebati. Tekankan ke dlm tin tart & bakar 10 min. 2. Pukul cream cheese & gula sehingga sebati. Masukkan telur, krim & pukul sehingga sebati. Bakar 30 min @ 160C. Sejukkan di suhu bilik. 3. Cairkan coklat & campurkan krim. Sejukkan dlm peti ais semalaman. Made this for our dinner last night on request by whole family to have spaghetti, salmon, garlic bread & mushroom soup. Indeed they spelled out the menu as such. I only added my creativity for the spaghetti sauce. 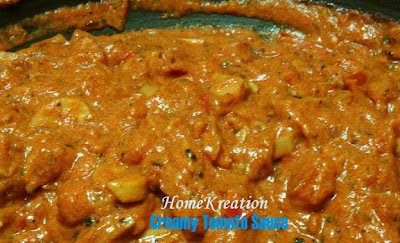 This time I tried creamy tomato sauce from AllRecipe (but modified to suit my taste and made do with ingredients in hand) and it was a hit. 1.Saute onion & garlic in olive oil. Add in chopped tomatoes, tomato puree, basil, oregano, pepper, sugar & salt. Boil 5 minutes until thick. 2. Remove from heat & add in cream & butter. Return to (low) heat & simmer another 5 min. 3. Serve with your preferred pasta. My hubby & I did not really like Kuih Kosui due to its undescribeable taste & smell (rasa kxxtxt) but looking at the recipe I couldn't understand why that is so. Somehow, I gave it a try today in order to clear up Gula Apong stock in my pantry. To our surprise it turned out to be delicious with nice aroma. The sweetness is moderate & not too sweet. 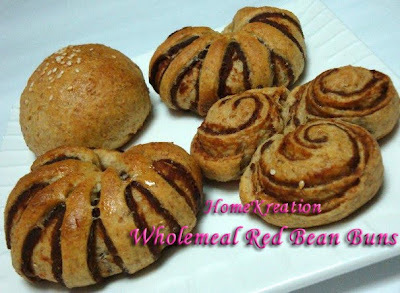 Those who like this kuih must try this version. 1. Place both type of sugar in a pot with little water & cook until sugar is dissolved. Add water until it measures 1000ml (1 liter). 2. Slowly add sugar mixture into flour while stirring. Add in Lime Water & browning. 3. Pour into oiled tin & steam above rapidly boiling water for 45 minutes. 4. Completely cool the kuih before cutting & coat with coconut. Note: while hot, the kuih is sticky and goey. Don't panic, it will firm up once cool. This was our dinner last night. I was too tired after returning from office & not in mood to cook varieties or anything complicated. Fried rice always in mind as rescue when such situation arises...hehe. After all were ready then I remembered Nor's demonstration wrapping fried rice in omelet & decided to try... leave to Nor to judge mine above...hehe. Anyone interested can check here on step-by-step demo by Nor (Tganu). Maceh ya Nor. 1. Season rice with salt & pepper. 2. Heat up some oil & fry shallots & garlic until brown. Put aside. 3. Fry sliced sausages & put aside. 4. With remaining oil, stir fry pounded chilies, tom yam paste & curry powder until fragrant. Add in oyster sauce & soy sauce. Add in fried onions, garlic & sausage. 5. Wrap in omelet (optional). Serve with crackers and whatever else you like....enjoy! Awesome... awesome...awesome.....! That's all I wanna say..... If you want some, you gotta try yourself. The recipe taken from Diana (FRD) contributed by Mamafami & MakNgah. Thanks to all for sharing. 1. Ayak tepung, serbuk penaik dan garam. Ketepikan. 2. 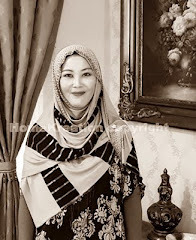 Pukul mentega dan gula hingga kembang. Masukkan telur dan pukul lagi. 4. Masukkan 1/4 susu, putar, masukkan 1/4 campuran tepung, selang-seli hingga habis. 5. Lenser acuan dengan sedikit minyak masak. Sudukan bancuhan agak-agak separuh acuan, sudukan pula sedikit kaya dan tutupkan dengan lebihan bancuhan. 6. Panaskan ketuhar pada 145 C dan bakar pada rak tengah selama 10 - 12 minit. Along guna acuan takoyaki, bakar atas dapur je. Add in egg while continue beating. Add in milk & flour alternately. 2. Fill 1/2 muffin cup, sekaya and cover with some batter. 3. Bake 145C for 10-12 min in the middle rack. (I did not bake mine in oven but just use takoyaki mould on top of a stove). 1.Wash & boil bamboo shoots until tender. 2. Heat up some oil & stir fry pounded ingredients until fragrant. Add in boiled bamboo shoots & salt. Sis Mala gave me a huge fish today (locally it is called "Ikan Kipas") and my MIL usually cooks this fish as above dish. I cooked the above to please my hubby & he had double plates tonite (he likes simple dish like this)...! If you are watching your diet, this is good for you....hehe. Place all ingredients in a pot with sufficient amount of water. Cover & boil until fish is done.... ready! I love this kampung style breakfast - steamed tapioca served with Sambal Ikan Bilis.... emmmmmh delicious..! I steamed the tapioca in a pressure pot resulted in a very soft melt in the mouth flesh! 1. Heat cooking oil & fry chilli paste & pounded shallots until fragrant. 2. Add in tamarind juice & fry for a while. 3. Add in Ikan bilis, salt, sugar and stir for about 5-10 min until dry. Add in a bit of water if you like it wet. 4. Finally add in chopped large onion & stir until onion is soft. I made this cake today to give to a colleague (Ms Rash) who is leaving tomorrow. 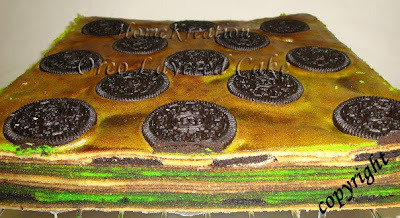 I sliced thinly one side so that you can see the pattern but it is too thin that you cannot see the oreo layers (sorry friends I can't slice too much...). There were several requests for the recipe before hence as promised I have tested another recipe which I've gotten from Rasa magazine. 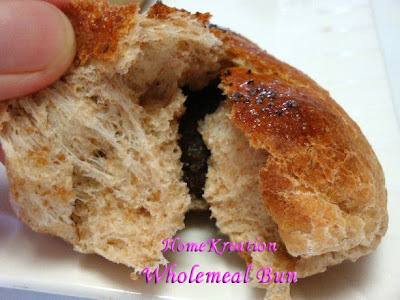 This is a fabulous recipe & worth making - deliciously moist & rich taste. This time I made different pattern of the layers. 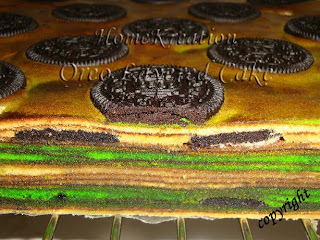 Instead of layering the pandan portion in the middle, I alternated the two colors as above and splitted the oreo cookies. Previous pattern is here & here. 1. Beat A until fluffy. 2. Beat B until thick & white. 3. Mix both A & B until well blended. 4. Divide into two equal parts. Mix one part with Pandan Paste (add color if not green enough). 5. Spread 8 spoon of plain portion into lined & greased tin. Continue layering per your preferred pattern. For the last layer, bake for 15 min at 180C. Mixed all ingredients in a pot & boil until chicken is cooked. When I made this previously (see here) was with peanuts added but skipped peanuts this time. Recipe previously taken from Nor's (Tganu). 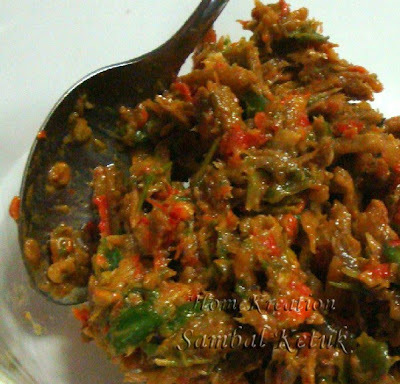 1 handful ikan bilis, 3 Green Chilies, Cilipadi (amount up to your taste), 1 cm belacan, Salt & Sugar. 1. 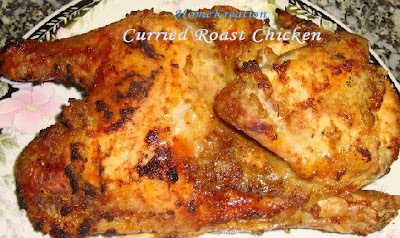 Rub chicken with salt , blended ingredients & curry powder. 2. Bake in oven at 250C for 45 minutes (I baked mine in microwave oven for 28'). 3. Chopped & serve with brown sauce (I made from instant powder). hehe.... jangan boring ek.... hari-hari kita makan roti wholemeal....! Kali ni kita cuba resepi dari Mamafami pulak (orig resepi dari Hanieliza) tapi Along buat pelbagai bentuk & dua jenis inti (red bean & kelapa). Cara-cara membentuk juga di sertakan. Along buat half resepi di bawah ni tapi ada technical error... terlupa nak half kan sukatan air, so selepas 40 minit intai2 kat dlm bm tengok cair mcm tepung cucur baru tingat sukatan air silap. Utk remedi, along masukkan 200g tepung biasa & tambah lagi separuh yis... nasib jadi gak you.... tapi dah tak ori laaa... huhu. ok, meh tengok resepi. Along copy jer dari Mamafami (Mama buat inti kari). TQ ya Mamafami & Kak Hanieliza. 1. Mix well ingredients A. 3. Add in margarine and knead again till soft and elastic. 4. Divide the dough into 50g balls. 5. Shape the dough to your liking. 6. Leave to prove till double the size. 7. Bake in a preheated oven at 180 degree celcius till golden brown. 8. Once out of the oven, brush some margarine on top. I love this combination of thickly sliced wholemeal bread & vegetables with no added sauce necessary. 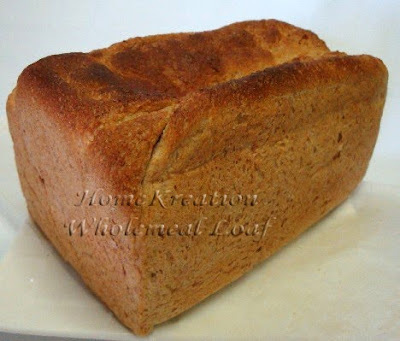 With home made bread, you can slice to the thickness that you like & I always like mine thicker than the standard shop's slices so that I can enjoy the softness & rich taste of the bread.... emmmm.... anyone.....? 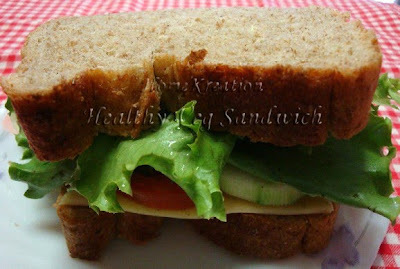 Let's make vegetable sandwich: 2 pieces whole meal bread (that I made a day before), a slice of cheese, salad leaf, slices of tomato & cucumber & dashes of pepper. Butter the bread slices & sandwich the vegetables & cheese... enjoy! 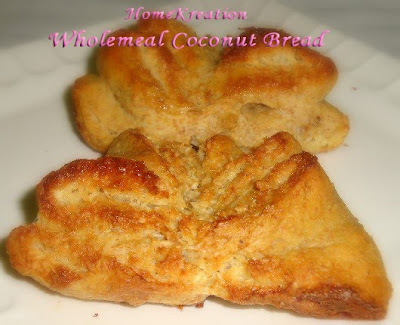 I prefer wholemeal bread over white ones whilst the chidren is the opposite (my hubby is neutral, no fuss). 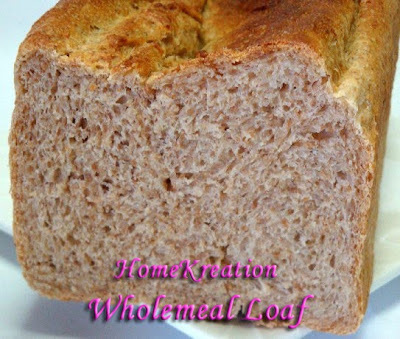 Anyway this time mummy is going to bake something for her liking since there is a packet of high protein wholemeal flour bought quite sometime ago from Brunei. I'm going to make vegetable sandwich for my packed breakfast tomorrow.... the sound of "vegetable" makes it worst to their liking but they can have the red bean buns instead although they are also wholemeal...! 1. Process all ingredients, except butter, until coarse dough is formed. Add in butter & continue kneading until shiny & springy. 2. Place in a container & cover with plastic wrap. Allow to leaven for 40 min until 2x size. 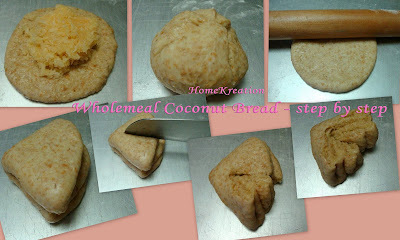 (Step 1 & 2 can be done using bread maker). 3. Punch the dough, divide into two portions and roll each flat. Roll like a swiss roll & place in a lined/greased baking tin. Allow to leaven for 40 min. 4. Bake at 200C for 30 minutes or until nice golden color. Long time no see me eh.... auntie2 rindu kat caya tak....? Ini Liana posing spesel utk auntie2 semua.... mmmmuah...! Apart from calling mama & abah, she likes to call "bird"... my house is surrounded by a lot of cheerful birds & when her dad first introduced it to her, she got it right away... clever girl...! 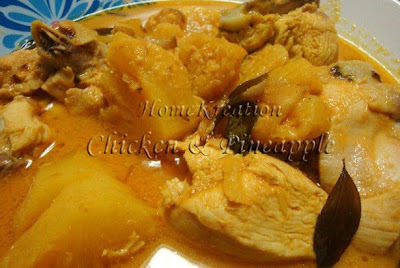 If you are bored with the typical way of eating Roti Canai or you are lazy to prepare curry for dipping or if you have leftover Roti Canai, here is a quick & delicious way to enjoy Roti Canai. Heat up few tbsp oil & fry pounded ingredients until fragrant. Add in Soy Sauce & break in the egg. Stir quickly & add in Roti Canai pieces. 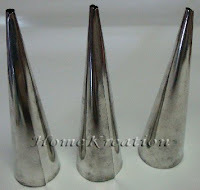 This has been in my to-do-list for ages ever since I bought the cream horn tubes years ago. I finally gave myself no excuses anymore. Here they are - come & join me to enjoy this delicious pastry...! The photo above on the right is a bite from the bottom disclosing the blueberry jam.... emmmm....nyummmy...! - Mix all except cream in a pot & cook until thicken. - Cool then beat in cream with mixer for 1 min until thick & creamy. 1. 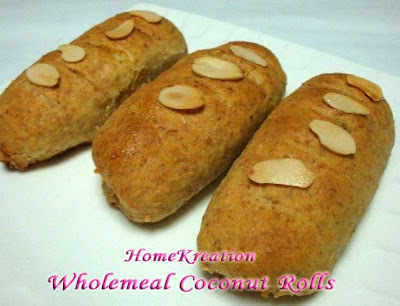 Roll pastry into 50 x 20 cm. Cut into eight 50cm long strips. 2. 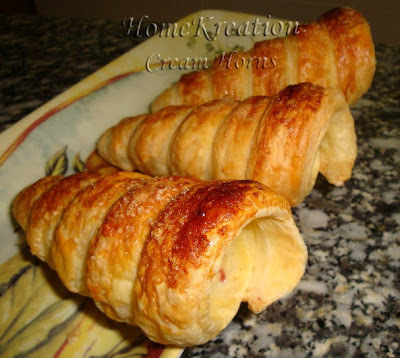 Grease cream horn tubes. 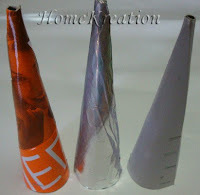 Wrap a tube with the pastry strip starting from the narrow end. Brush with egg white & sprinkle sugar. Place onto greased baking tray. 3. Bake at 200C for 20 min, then 190C for 10 min until brown & puffed. 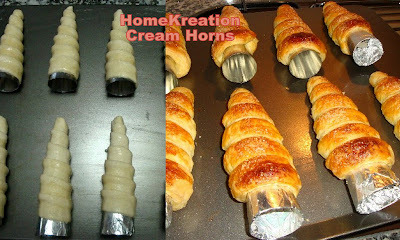 Leave on tray for 5 min & carefully twist to remove moulds from horns. Leave to completely cool before filling. 4. Fill with jam, then followed by custard cream.